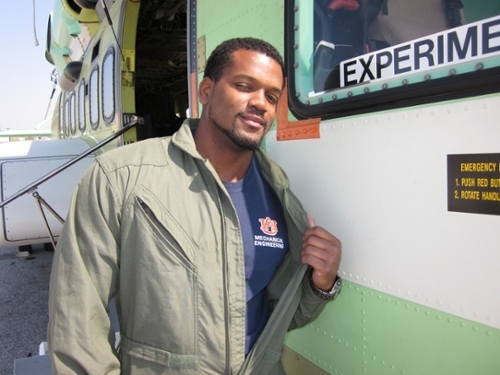 Dionel Sylvester, '10 mechanical engineering, is flying high as a fight test engineer in Florida. He is flying so high in fact that the current helicopter he's testing will be used for the future president of the United States in just a few short years. Read below to learn more Dionel's job working in the friendly skies. What are some cool facts about your industry or your current project? In just a few years from now, the president will be flying in the helicopter I am currently testing for him or her. Sikorsky Blackhawk Helicopter (UH-60) entered into service in the 70s and it’s still being produced in high volumes today. We are now testing one of the largest helicopters, the CH-53K, and a helicopter that uses X2 technology which is famous for breaking the rotorcraft level flight speed record, the Raider. Why is what you’re doing important to people throughout the country?